In Littleton, NH, there is a wonderful place called “Chutters Candy Counter” that is known for having the longest candy counter in the world. 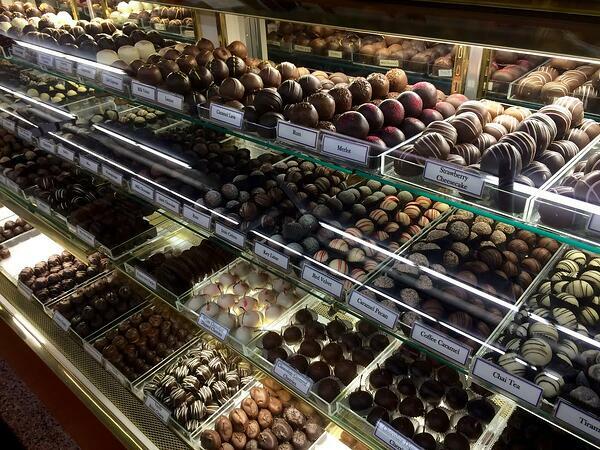 In addition to the dozens of candy options, Chutters also sells homemade fudge, chocolate, and truffles. Truffles are confectionery sweets made from a ganache, which is a mix of cream and chocolate. These treats can come in hundreds of flavors, and Chutters offers a ton of them. Chocolate truffles have a long history, starting as far back as 1895 and first became popular in France. They were named truffles because of their likeness to the luxurious tuber fungus that is a staple of French cuisine. A more detailed history suggests that truffles were invented in 1920 by the famous French chef Auguste Escoffier’s apprentice when he accidentally added hot cream to chocolate. When truffle became popular around this time, they were originally made of balls of ganache rolled in cocoa powder. Now, it is much more common to have the ganache coated in a hard chocolate shell. Truffles are also often covered with nuts, coconut, icing, or dyed chocolate for extra flavor and a fancy flair. There is still some controversy about whether a truffle is still a truffle if it doesn’t have ganache, but some chocolatiers have replaced the ganache for fillings like caramel, fudge, fruit, or nuts. They are usually made into spheres, but truffles can be formed into cones, cubes, rectangles, etc. Chutters’ truffles are a mix of traditional and updated methods. We use ganache for the filling, coat the ball of ganache in a hard chocolate shell, and decorate with nuts, sprinkles, powder, chocolate, and more. We’d like to think we are uniquely traditional chocolatiers! Chocolate gets a bad reputation in a lot of ways, but many studies suggest that a chocolate snack is better than the carb filled alternatives. For example, people think that chocolate is high in caffeine. In reality, a 1.4 ounce chocolate bar only has 6 mg of caffeine. For comparison, a cup of coffee contains 65-130 mg of caffeine. Basically, an entire chocolate bar only has the caffeine of a decaffeinated coffee. People with high cholesterol also tend for avoid chocolate because of the saturated fat component. The type of saturated fat in chocolate is called “stearic acid”. The stearic acid doesn’t convert the same way that most saturated fats do, and actually have been shown not to raise cholesterol in the same way. Dark chocolate is especially recommended for heart health, as it tends to raise HDL (good cholesterol) levels. Chocolate has similar nutritional value to a glass of wine, with good polyphenols that have been known to decrease the risk of coronary disease. Another myth is that chocolate creates cavities, but chocolate is not the only reason a cavity happens. Acidic foods, alcohol, and poor dental hygiene contribute more to cavities than sugary foods. The calcium and phosphate levels in the chocolate may actually protect tooth enamel with its fat content. Chocolate clears from the mouth more quickly than other candy, leaving less residue to wear away the enamel. All in all, dietitians are saying that dark chocolate in moderation is a healthy snack that is good for your teeth, low in caffeine, and increases good cholesterol levels. You definitely shouldn’t eat 30 truffles in one day, but there’s nothing wrong with stopping in for a dozen and treating yourself over the week. Want to learn how to make your own truffles at home? There’s the official french process of truffle making, which takes a lot more time and expertise. This recipe is one that can be easily done with little fuss. Decorate and flavor however you want! This is a plain chocolate truffle recipe. Cover cookie sheet with aluminum foil. Melt the chocolate bars in a saucepan over low heat, stirring constantly. Remove from heat. Stir in butter and heavy cream. Refrigerate about 10 to 15 minutes, stirring frequently, just until thick enough to hold a shape. 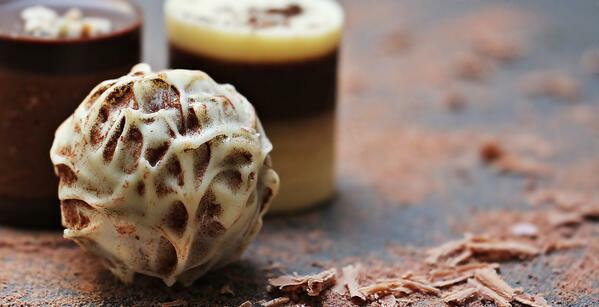 Roll about a teaspoon of ganache (chocolate mix) in your hand until it is sphere shaped. Freeze the spheres for about 30 minutes. While the ganache spheres are in the freezer, heat shortening and chocolate chips over low heat, stirring constantly, until chocolate is melted and mixture is smooth; remove from heat. Dip truffles, one at a time, into chocolate and place on the cookie sheet. If you want your truffles decorated, immediately sprinkle some of the truffles with finely chopped nuts or decorating candies. Refrigerate truffles about 10 minutes or until coating is set. Serve truffles at room temperature. There you have it! Now you know about the history of truffles, the different varieties, debunked truffle myths, and recipes for truffle making. If you’d like to keep learning about chocolate and candy at Chutters, subscribe to our email and we’ll send you a monthly newsletter including fun candy facts like these.